Experience a new look & enhance your beauty in with CEUTICAL SKIN CARE, a high quality range of skincare products recommended by skincare professionals. Without any painful procedure and no injection necessary, you can reveal your true beauty with just some drops of these precious serum. Why spend thousands for a skin treatment if you can do it just by yourself in a such irresistible price? 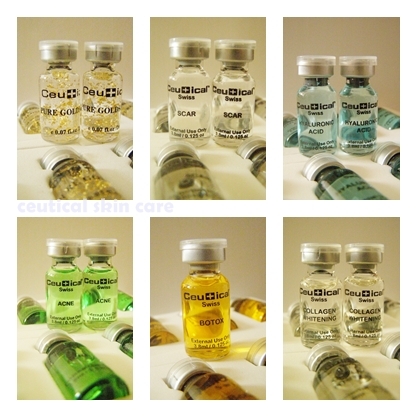 CEUTICAL SKIN CARE is a high quality range of skincare products recommended by skincare professionals. This skin care range has been established since 2008 and become one of the trusted brand used by many beauty & medical professional, a lot of doctors, beautician and skin care clinic have been using this serum as a part of their beauty treatment & services. Ceutical serum only made from botanical composition without any prohibited or harmful ingredients for your skin, as a matter of fact this skin care is registered under Malaysian Pharmaceutical Bureau, its definitely safe.